He stood looking up the fell, a very small man at the bottom of a very big mountain. On holiday in the Lakes he had decided to “have a spin with the hounds”. Usually he followed hounds on horseback but today was different. It had begun well enough with coffee laced with rum in the farmhouse, he had been made welcome as he joined the group stood in front of the roaring fire but now the last hound had disappeared over the mist shrouded ridge 1800 feet above him and the followers were starting to climb the fell behind them. He followed slowly in their wake. Before long he had stopped and finding a convenient rock sat down to regain his breath. Hounds and hunters had long since gone and he was alone, very alone. The hunting songs on this site have proven to be one of the most visited sections. When I launched the site I offered to put on line “hunting songs” not necessarily confined to those about Lakeland. In the last two years I have amassed quite a collection and perhaps it’s time to share them. So especially for the chap described above (and the story is true), here is the first collection of songs and poetry of the mounted packs. O’er the grave where poor reynard we buried. Was known everywhere in the morning. Or laugh at so awful a sell. And our hunt we had lost on the morrow. But never in honour of him. As soon as they get the news. And homewards talked of retiring. Such a basely earned trophy of glory. Take care to wipe their eye. 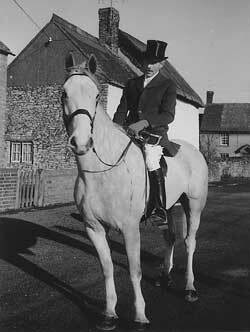 *Old George Moore of Appleby, shot a fox accidentally. 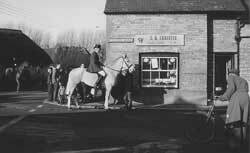 Mr. Thomas Boothby of Tooley Park founded the Quorn Hunt in 1696 in, Leicestershire although hunting the fox had taken place on a more informal basis prior to that date. 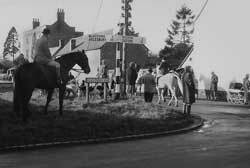 The Hunt takes its name from the village of Quorn, where the hounds were kennelled from 1753 until 1904. When will the *Marquis come? Who can tell? Half-past twelve or half-past one? Who can tell? Is he sober is he drunk? Nipping "like Myn heer von Dunk? Will he ride or will he funk? Who can tell? Shall we have to wait again? Who can tell? In the wind and in the rain? Who can tell? Leaves us to the pelting storm? Who can tell? Where'll he draw by way of luck? Who can tell? Gartree Hill, or Bradgate Park? Who can tell? North or south, or east or west? Who can tell? Where, oh where, rings Goodhall's ** horn? Who can tell? Why came I with this cursed Quorn? Who can tell? And declare you love the chase? Who can tell? The first irrefutable record of The Haydon Hunt is 25th November 1809, during which day, on the vast Greenwich hospital estates sequestered from the Earls of Derwentwater, they killed their fox in the open after a hunt of some three hours. 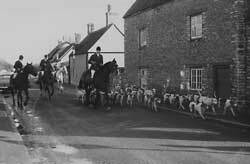 The pack, at that time, hunted both hare and fox and was “trencher-fed” with local farmers throughout the country, each responsible for perhaps a couple or two of hounds, meeting twice a week. Although the pack was not kennelled together at that time, the members based their headquarters at The Anchor Inn, at the southern end of the old stone bridge spanning the South Tyne at Haydon Bridge. This former coaching inn also survives today. They belong to a gentleman who is worthy of their name. One and all in chorus call, hark! hark away. To cast off at the Rookery, a wood close to the Hall. For the hounds were all around him near a Rhododendron bush. Then Reynard getting well ahead, he made for Painsdale Burn. So they dragged him on, but lost him, near to the Spittal Farm. But he lost his life, his head and brush, at the top of College Cleugh. For they never seek the fences in search of any gap. With thanks to Francis Templer and Ian Scanlan of the Haydon Hunt for contributing the above song.